Delabole Slate has been used as a building material for some 800 years, and has been quarried continuously since the early 17th century, when Carew in his survey of Cornwall wrote "in substance thin, in colour fair, in lasting long and generally carrieth good regard". The quarry is 425 feet deep and more than a mile and a half in circumference, and provides a quality of slate that is exceptional. During the reign of Elizabeth I, the five quarries that existed within the vicinity of the present pit assumed considerable importance, delivering slate "throughout the realm, and even exporting it by sea to Brittany and the Netherlands". 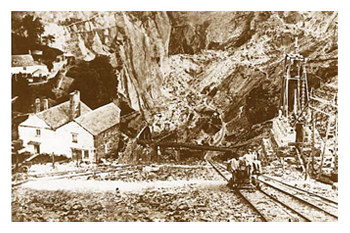 In 1859, in Murrays Handbook of Devon and Cornwall, the author wrote "the quarries present one of the most astonishing and animated scenes imaginable". About 1,000 men were employed at this time, raising an average of 120 tonnes of slate per day. 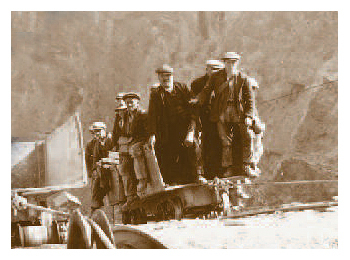 Long before the coming of the railway, the slate was cut and hauled six miles to Port Gaverne where it would be loaded onto vessels moored in the harbour area. It would take thirty wagons, pulled by over a hundred horses to load a sixty ton ship and as late as 1890, women still assisted with the stowing of slates. 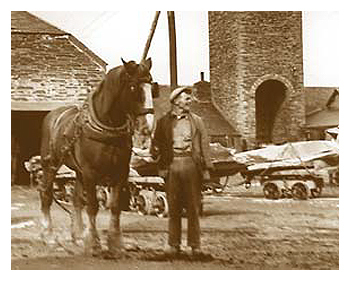 In 1841, the five quarries formed themselves into a single controlled unit, and the Old Delabole Slate Company was formed, becoming the present Limited liability company in 1898. Today, by applying modern mining techniques and utilising only five skilled quarrymen, an average of 120 tonnes of slate block is still quarried each day. Using the latest diamond wire saws, 600 tonne blocks are sawn from the quarry face, eliminating the age-old method of blasting. Wire sawing improves recovery, thus preserving for future years valuable reserves of slate, and finally laying to rest the historic building of waste mountains. We will be updating this section soon to include geological history, so please visit again. Thank you.